Today's Bizarro cartoon (right) is brought to you by the wonders of electricity. Get some today! 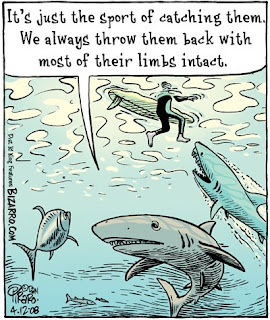 Today's shark-infested funny is about the appalling habit we humans have of hiding sharp things in food and offering it to animals. We call it "fishing" and convince ourselves that because we can trick animals into hurting themselves, we should. I used to fish as a kid but I grew out of it–much later than I should have, I'm ashamed to say. Fisherman who throw them back after injuring them are slightly more admirable, in my opinion. At least they admit they're hurting things for fun and not pretending that eating the victim justifies its suffering. We are a strange species. The 'toon below is one I did on the same subject a few years back. 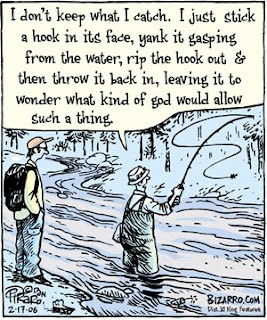 Fly fishermen thought it was very funny, admitting the truth behind it. I suppose you have to admire them for "owning it." CrazyHNW and I are fostering a baby racoon this weekend – smaller than a newborn kitten. I'll write about it in my next blog. Check back for more shenanigans, amigos. Love the subject of these two comics. People often forget about fish as feeling beings.